Cage the Elephant in Montreal or Quebec City? Inform me about the next events for Cage the Elephant. 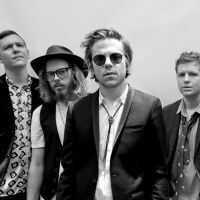 Enroll yourself to our priority waiting list for Cage the Elephant to be alerted when new tickets are available. Filling this form doesn't engage you to any purchase. Cage the Elephant is coming back to Montreal, and this time, it will be at the Bell Centre ! On May 10th, 2016, Cage The Elephant will be performing on the big stage, alongside Portugal. The Man and Broncho. The last time Cage The Elephant visited Montreal goes back to September of 2014, when they opened for The Black Keys. Don't miss their return, this time in a headlining slot !